Cut cauliflower into 1-inch florets (about 10 cups). In a large baking pan toss cauliflower, with oil to coat and roast in middle of oven about 30 minutes, or until golden. Five minutes before removing from the oven, add the onion and garlic. In a 4-quart pot simmer chicken stock, roasted cauliflower mixture, bay leaf, 30 minutes, or until cauliflower is very tender. Remove the bay leaf and use a hand emulsion blender to puree soup until smooth. Stir in cream and salt and pepper to taste. Heat soup over moderate heat until just heated through. Ladle into individual bowls. 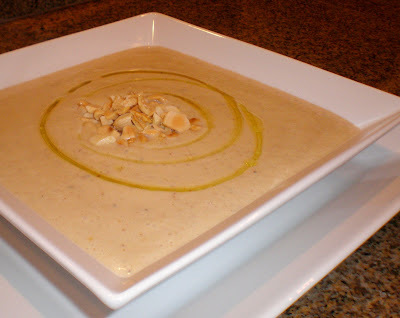 Swirl the truffle oil onto the soup and top with a large pinch of marcona almonds into the center of each bowl. Grind fresh pepper over each one if desired.